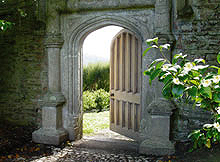 When I first heard of Tregothnan a few years ago, I wanted to go there immediately. Haven't made it there yet, but at last I've tried their tea--the only tea grown in England. Yes, England! Their story is a fascinating one, which you can read about at their website. Tregothnan recently sent me three of their black tea blends for review: Afternoon, Earl Grey and Classic. If you've been reading Delightful Repast for any length of time, you know that whether I've purchased a product or it was given to me, I always tell my readers what I really think. The first Tregothnan tea I brewed was the Classic tea in their new loose leaf pyramids. Unlike standard teabags, the fabric pyramids allow plenty of room for the tea leaves to unfurl. I brewed the tea in a pot with 8 ounces of freshly boiled water per 3-gram pyramid. After 3 minutes I poured a cup to be tried plain. After another minute I poured another cup--a bit stronger to stand up to a splash of milk. 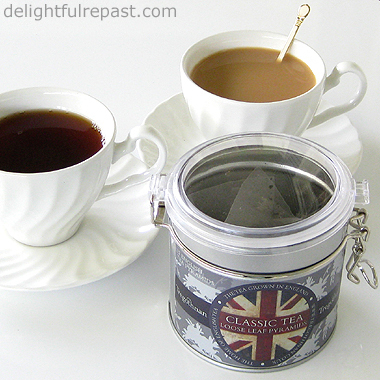 The Classic tea is the English-grown tea blended with imported Assam to make a more tannic breakfast blend. The brewed tea has a good, rich color and a hearty flavour, making it a great morning cuppa. I added 2 teaspoons of milk (I always use 2%) to a teacup of the 4-minute brew and liked it even more. Then, just for fun, I stirred in 1/4 teaspoon sugar. Wonderful, but by no means necessary. Next up, the Earl Grey loose leaf tea. How much leaf tea to use is a matter of personal taste. I decided to go with 3 grams per 8-ounce cup of water. What that amounts to by measure rather than by weight is, in this case, about 2 (level measuring) teaspoons. Earl Grey, one of my favourite teas, can be very good or, more often, very bad. The characteristic bergamot is often overdone (one major brand tastes more like pine cleaner than tea!). Not the case here. The Tregothnan tea blended with imported Assam has just the right amount of bergamot. The 4-minute brew of this subtle blend was perfect. The Afternoon tea blends the Tregothnan tea with imported Darjeeling. Since I never add milk to Darjeeling, I didn't add any to my 4-minute brew of this lovely tea that has been referred to as a "delicately refreshing blend." Maybe I'm having one of those rare days when I'm indecisive, but I can't choose a favourite among these three teas. I like them all! And your House Keeper Biscuits are perfection with a nice cup of tea! Hmmm. Was counting on you to give us your favorite, Jean. Our granddaughter is a recent tea connoisseur. Interesting post, and yet another reason to visit Cornwall! As if either of us needed yet another reason to visit Cornwall, Judy! Glad to hear about your granddaughter! The teas sound wonderful but I am wondering....organic or conventional? Nothing was mentioned regarding this. I am a big tea drinker but I like my tea very simple, just tea....no added chemicals. Thanks. These teas sound lovely.I am a brit in the USA and find it hard to find good English tea so will try these. Come over and see what I'm cooking up in the kitchen! Patrice, I haven't fully examined Tregothnan's pest management practices; but that is something I'm interested in as well. I buy nearly all organic foods. Emma, it *is* hard to find good tea. Thank goodness for mail order! Thanks Jean...let us know what you find out if you can. What a useful and pleasant time...to sit and drink tea and reflect. I love Earl Grey in the afternoon....it just seems to suit and is so refreshing!! I agree, Joan! I drink more Earl Grey than anything else. Alas, I’m still only a “virtual” tea drinker. Love to read your precise, ritualistic ways of brewing/drinking the stuff, but it never quite crosses the bridge into reality for me. Always tastes like something diluted, or not quite strong enough, or otherwise just a bad thing to do to water. But then, I’m equally impervious to wines. The ceremonial stuff fascinates me – it’s psychological aspect seems to be as palpable as lifting a glass and quaffing – but the temple of my bod just doesn’t get it. Different strokes…bring on the chocolate! Thank you, Sully. I like that - a "virtual" tea drinker! And "equally impervious" to wines. It's most unusual that such a one as you would even take notice of the ceremonial aspects. Thanks, Pauline! I just had a cup of Tregothnan Earl Grey and thoroughly enjoyed it. Hope to visit the estate one day!